This month, we really wanted to focus on one of our fun and knowledge-packed medical courses here at Blake Austin College. The Featured Course of the Month is our Dental Assisting Program! Here is everything you need to know. This course is 9 months long. We currently only offer this course in a full-time schedule. You Might Enjoy Dental Assisting If. . .
. . . you are between ages 17 and whatever! If you love what you do, your age can’t hold you back, only you can! However, we the state requires you be at least 17 years of age to enroll.
. . . you are ready for a new career. Because our program can be completed in as little as 9 months, your new job could be right on the horizon.
. . . you are ready to do something for YOU. Some of our students have been growing their families, and are happy to be a parent! Sometimes, after your family is big and thriving, you want to do something for yourself. There’s no better way to improve you life than learning something new.
. . . you like to do arts and crafts. Many dental assistants love to do things with their hands. This program (and career field) require that you want to work with your hands, especially with a focus on the tiny details.
. . . you are driven. The dental field is wide open! If you are driven, passionate, smart, outgoing, and all around awesome, the dental field could open up many doors for you! 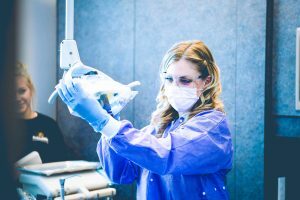 Does dental assisting sound like the ideal career? Our program could be the perfect fit for you! Check out our program page for more information, and remember to contact us to get started. previous post: Is Cosmetology School Right for You? Quiz! next post: Your Next Mani Design Based on Your Zodiac Sign: QUIZ!